Liked it overall, but I did have my problems with it. 1. The zombies aka zeds, shamblers, revs (short for revenants) -- there is nothing unique about Jacobs' zombies: they are slow, and gooshy, and stink. They are dangerous in hordes and are attracted to sound. All this we've seen before; nevertheless, the descriptions are remarkably vivid -- skulls shattering, teeth splintering, intestines bursting, and always the terrible, gag-inducing smell of rot. 2. The first 121 pages are a complete adrenaline rush. Action begins on page 1 and does not relent for a moment. We meet Dr. Lucy Ingersoll on the afternoon her hospital succumbs to chaos. An inexplicable virus is causing people to seizure, auto-cannibalize, attack, die and re-animate. Lucy is our entry point into the start of the end of the world. She assesses her situation and realizes she must abandon the hospital if she is to rescue her son, Gus, at home with his father. In her attempt to get to her family, Lucy crosses paths with Knock-Out, a giant of a man with a gentle and kind way about him. These 121 pages are strong enough to stand on their own as a rip-roaring novella of zombie insanity, replete with nuclear detonations. The shifting character POV did not work for me. The first 121 pages grabbed me by my short hairs. I love the brutal immediacy of the story. Everything feels so urgent and perilous. I love Lucy and Knock-Out. Then the book shifts gears and we get Tessa's story. Okay, I'll keep following you. Tessa's story is sad and icky. But intense. I found her very sympathetic. Just as I was getting emotionally invested, the story shifts again. Now it's three years later and Lucy's 14-year-old son Gus takes over narrating. Then the POV shifts again and we have some chick Barbara sharing the minutes from the various committee meetings of the Bridge City survivors enclave (not the best choice). And there will be one more POV change before the novel concludes. So many shifts in narration, from first to third person, lost me by the end of the book. It was hard to sustain emotional involvement with any of the major characters. The book ends up reading like a collection of interconnected short stories, and on their own, each of the chapters are actually quite strong. It's when you force them to act as a novel where things fall apart. That's when huge problems with pacing and characterization appear, along with a natural momentum towards a meaningful and satisfactory climax (of which there isn't one). Despite these issues, there's something about this book that recommends itself. It's got that gritty, western kind of vibe going, a little Mad Max, a little The Road and of course Kirkman's The Walking Dead (it's just not possible to read about the slavers and Captain Konstantin and not be reminded of the Governor). 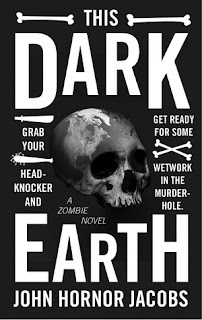 If you're craving zombies, and a bleak and desperate post-apocalyptic landscape, you could do a lot worse than This Dark Earth.The author has also written a weird, mash-up Lovecraftian novel called Southern Gods (check out Dan's review) that I'm very interested in trying out. It makes me think of Bubba Ho-Tep and everything that is awesome about that movie.